The EU’s General Data Protection Regulation, GDPR, was pushed through using intimidation. Now, it is time to look at the opportunities it provides to people, companies and society. Something as technologically complicated as a car would be difficult to operate if there was no human-oriented user interface for it, such as a steering wheel. We are currently facing a similar situation with regard to managing data about ourselves – we lack a steering wheel. The event presented the results of a survey conducted in four countries on people’s views concerning the use of data about them. According to Koskinen, the responses shared one value in particular: autonomy, or the ability to control the use of data about oneself and one’s own digital life. The joint project between the University of Turku and Sitra specifically considers the values of the data economy. “If we become human-oriented, we must hear what people want, and that has been one of the objectives of this survey. If we are able to implement human-orientedness, it can genuinely facilitate the building of trust between companies, society and people, and that is the aim of this project,” Koskinen said in his speech. Among the respondents, it was Finns who found their own decision-making power particularly important, with 74% finding it important or very important. For the respondents from all four countries, the corresponding figure was 59%. In all, however, the differences between the countries were minor. But there were certainly differences between all respondents, and it is possible to sketch different user profiles for the respondents as some of them were more enlightened and active with regard to the use of their own data than others. Professor Minna Isomursu, from the IT University of Copenhagen, talked about the profiles at the event. “Many technological development projects promoting digitisation aim at people taking more active roles in their lives,” Isomursu said. What do you think? Are you conscious, suspicious or indifferent with regard to data about you? The Sitra Debate and the questionnaire presented were part of Sitra’s Fair data economy project to build the foundations and joint Europe-wide rules for a fair and smooth data economy. 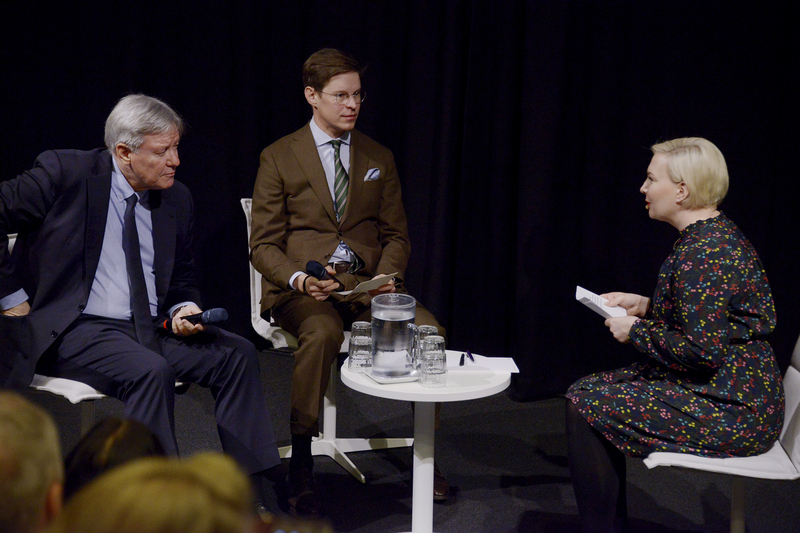 The first pair of debaters on stage were Data Protection Ombudsman Reijo Aarnio and Jussi Mäkinen, Chief Legal Counsel at Technology Industries of Finland. They both believed the EU General Data Protection Regulation, GDPR, has already in less than a year changed the lives of both people and companies. However, more so through intimidation and sanctions than opportunities. “The information given to citizens is really incomprehensible. The platforms mostly used by people are not Finnish, they are GAFA parties (the big four technology companies: Google, Amazon, Facebook and Apple),” Aarnio said. Mäkinen, on the other hand, reminded the audience of the great opportunities provided by GDPR to Finnish operators. “We now need to functionalise GDPR. We are in a state of fermentation in which companies have survived the initial shock. We now need smart and technically functional solutions that move data and keep the data subject on top of the situation,” Mäkinen said. Whose rules will be used in the data economy game in the future? The second pair of debaters considered who will set the rules in the rapidly growing data economy and digital market. So far, the pace has been set by large US data giants, represented by Google’s Country Manager in Finland, Antti Järvinen. His debate partner was Pirkka Frosti, Founder of Digital Living International. Frosti strongly urged those in Finland and Europe to take action instead of moaning. “It is completely useless for us to criticise Google and Facebook. We all use them. What are we crying about? We can look in the mirror and think about why on earth don’t we have an option that I would adopt as a European and Finn,” said Frosti challenging the audience. According to him, it is completely logical for companies that operate on the basis of US legislation and perceptions of ethics and morals to fulfil their own terms and conditions when there are no alternatives available. One of the conclusions drawn from the results of the questionnaire presented at the event was that people’s lack of trust is an obstacle to the development of digital services. As many as 43% of the respondents reported that a lack of trust prevents them from using services in one way or another. According to Google’s Antti Järvinen, the shortage of trust is temporary in nature. “Companies evolve, go forward and build trust among consumers. They have no other option, nor should they have. This discussion is really healthy and welcome,” Järvinen said.